Finally got my High Elf Lord on Dragon! Sorry for the long break in writing as I have been very busy this year end. This also means very little time for Warhammer games and painting my 1000pts army. Well yep, as expected I have not finished painting said army. But the good news is I got my Warhammer fix by finally buying myself a High Elf Dragon for Christmas! Also picked up some of GW’s new “Foundation” paint and also some great painting advice from the Manager of the Sydney GW store. I will this painting advice as soon as I can! Great High Elves Modeling Tips from GW! 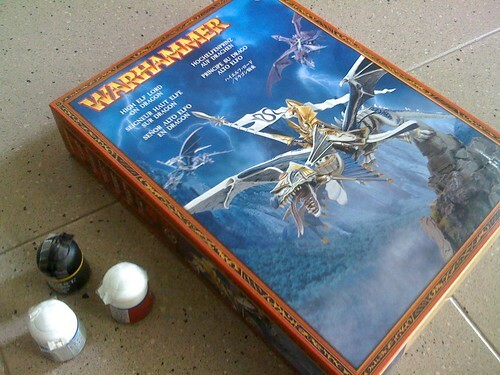 1) Modeling Dragons for all Warhammer armies by using the High Elves dragon box set. 2) Assembling the fearsome White Lion Chariot, a must have in most High Elves armies! 3) Modeling unit champions to give your rank and file more spice! My personal favorite! 4) Tips on assembling the High Elves Mage box set. 5) Tips on assembling the High Elves Lord box set. 6) Getting your Bolt Thrower box set assembled.